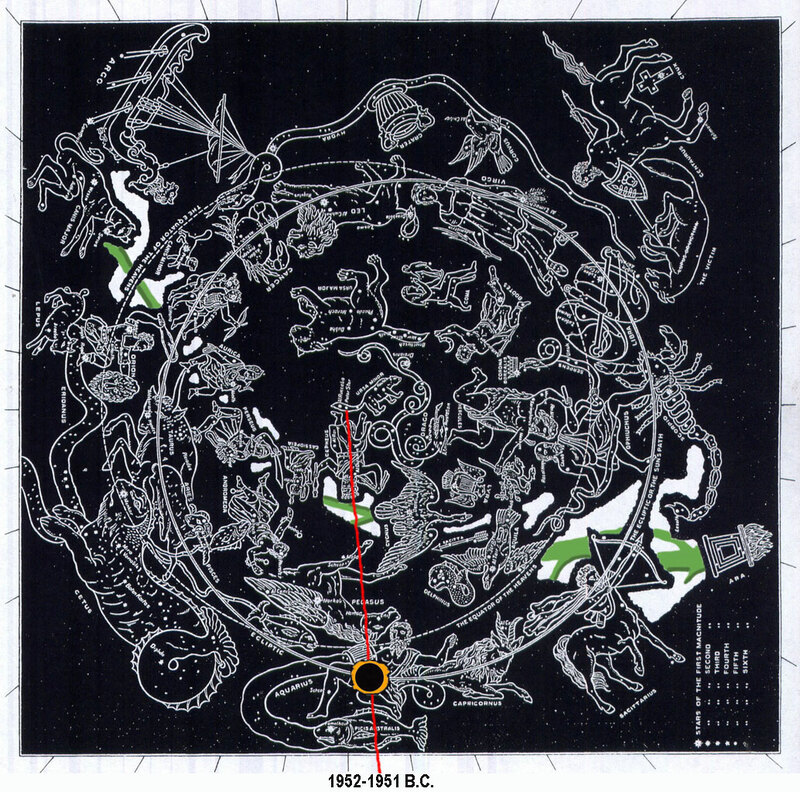 Genesis chapter 17 Star Chart: Clockwise from when "Abraham was ninety years old and nine, when he (Aquarius) was (red radius knife 360° sweep) circumcised in the flesh of his (solar eclipse) foreskin. And Ishmael (Aquarius) his son was thirteen years old, when he was (red radius knife 360° sweep) circumcised in the flesh of his (solar eclipse) foreskin" (Gen. 17:24-25) in 1952 B.C. till "Sarah shall bear unto thee at this set time in the next year" Isaac (Gen. 17:21) when Abraham was "an hundred years old" (17:17) in 1951 B.C. is a 360° day sweep. Notice that "kings (Cepheus) shall come out of thee" (17:6). Notice also that there is a 360° day sweep where 15° equals one hour since "Abraham (Aquarius) took Ishmael his son, and all that were born in his house, and all that were bought with his money, every male among the men of Abraham's house; and (red radius knife) circumcised the flesh of their (solar eclipse) foreskin in the selfsame day" (360° sweep) (17:23). 17:1 And when Abram (Aquarius) was ninety years old and nine, the Lord (Cepheus) appeared to Abram (Aquarius), and said unto him, I am the Almighty God (Cepheus); walk before me, and be thou perfect. 2 And I will make my (red radius) covenant between me and thee, and will multiply thee exceedingly. 6 And I will make thee exceeding fruitful, and I will make nations of thee, and kings (Cepheus) shall come out of thee. 7 And I will establish my (red radius) covenant between me and thee and thy (solar eclipse testes) seed after thee in their generations for an everlasting covenant, to be a God (Cepheus) unto thee, and to thy (solar eclipse testes) seed after thee. 9 And God (Cepheus) said unto Abraham (Aquarius), Thou shalt keep my (red radius) covenant therefore, thou, and thy (solar eclipse testes) seed after thee in their generations. 10 This is my covenant, which ye shall keep, between me and you and thy seed after thee; Every man child among you shall be (red radius knife) circumcised. 11 And ye shall (red radius) circumcise the flesh of your (solar eclipse) foreskin; and it shall be a token of the covenant betwixt me and you. 12 And he that is eight days old shall be (red radius knife) circumcised among you, every man child in your generations, he that is born in the house, or bought with money of any stranger, which is not of thy seed. 13 He that is born in thy house, and he that is bought with thy money, must needs be (red radius knife) circumcised: and my covenant shall be in your flesh for an everlasting covenant. 14 And the uncircumcised man child whose flesh of his foreskin is not circumcised, that soul shall be (red radius) cut off from his people; he hath broken my covenant. 15 And God (Cepheus) said unto Abraham (Aquarius), As for Sarai thy wife (Cassiopeia), thou shalt not call her name Sarai, but Sarah (Cassiopeia) shall her name be. 16 And I will bless her, and give thee a son also of her: yea, I will bless her, and she shall be a mother of nations; kings (Cepheus) of people shall be of her. 17 Then Abraham (Aquarius) fell upon his face, and laughed, and said in his heart, Shall a child be born unto him that is an hundred years old? and shall Sarah, that is ninety years old, bear? 18 And Abraham (Cepheus) (red radius) said unto God (Aquarius), O that Ishmael (Aquarius) might live before thee! 19 And God (Cepheus) said, Sarah thy wife (Cassiopeia) shall bear thee a son indeed; and thou shalt call his name Isaac: and I will establish my (red radius) covenant with him for an everlasting covenant, and with his seed after him. 21 But my covenant will I establish with Isaac, which Sarah (Cassiopeia) shall bear unto thee at this set time in the next year. 22 And he left off talking with him, and God (Cepheus) went up from Abraham (Aquarius). 23 And Abraham (Aquarius) took Ishmael his son, and all that were born in his house, and all that were bought with his money, every male among the men of Abraham's house; and (red radius knife) circumcised the flesh of their (solar eclipse) foreskin in the selfsame day (360° sweep), as God had said unto him. 24 And Abraham was ninety years old and nine, when he was (red radius knife) circumcised in the flesh of his (solar eclipse) foreskin. 25 And Ishmael his son was thirteen years old, when he was (red radius knife) circumcised in the flesh of his (solar eclipse) foreskin. 26 In the selfsame day (360° sweep) was Abraham (Aquarius) circumcised, and Ishmael his son (Cepheus). 27 And all the men of his house, born in the house, and bought with money of the stranger, were circumcised with him (360° sweep ).